Black Satin Cord Cord 2mm thick 91 metres per roll All colours of our satin c.. Bottle Green Satin Cord Cord 2mm thick 91 metres per roll All colo.. Cream Satin Cord Cord 2mm thick 91 metres per roll All colours of ..
Light Blue Satin Cord Cord 2mm thick 91 metres per roll All colour..
Navy Satin Cord Cord 2mm thick 91 metres per roll All colours of o.. 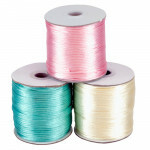 Pink Satin Cord Cord 2mm thick 91 metres per roll All colours of o..
Red Satin Cord Cord 2mm thick 91 metres per roll All colours of ou..
Violet Satin Cord Cord 2mm thick 91 metres per roll All colours of..
White Satin Cord Cord 2mm thick 91 metres per roll All colours of ..